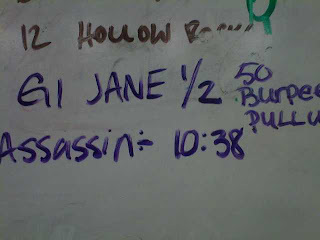 Sweet Assassin: "murder you in your sleep"
"murder you in your sleep"
This is my first WOD since my hip/back injury. I loved it. I missed "killing" myself. Not sure if I would be able to make it to 100. 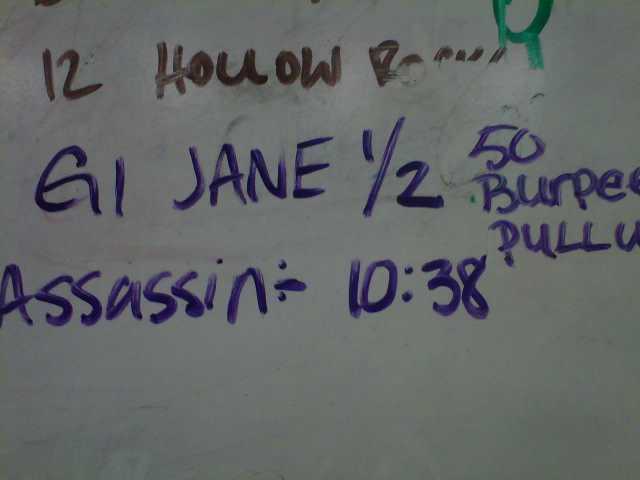 My last 10 of the 50 were slow, just cause my arms were giving out on the pull up. Every time I threw myself on the ground, I had a pukie burp... that's why they call them burpees. It's been about 12 hours since I did the WOD and my upper body is screamingly sore. It feels good to be back. Maybe 150 wall balls today. Lol. This video gets me so stoked!